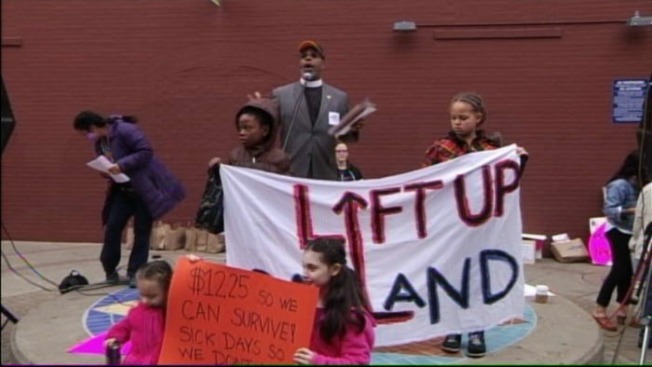 Hundreds rallied in Oakland for an increase in the city's minimum wage. - Feb. 15, 2014. Hundreds of people rallied in Oakland Saturday, calling for an increase in the city’s minimum wage. The group called Lift Up Oakland organized the event. They want to see the minimum wage raised to $12.25 per hour, and they want employers required to provide sick days to all workers. Members of the group fanned out to gather signatures to put the initiative on the November ballot. In this edition of Reality Check, Sam Brock looks at the evidence and pokes some holes in President Barack Obama's argument that the widening income inequality gap is the "defining challenge" of our time. Workers said the raise would help them become independent. "We have to get second jobs just to survive," Lift Up member John Hogue said. "We want this raise so we don’t have to depend so much on state, city and federal assistance." "Basically I don’t want a handout. I don’t want to depend on the government. I just want to be a providing parent,” home care worker Ebony Young said. The group needs 35,000 signatures to get on the fall ballot. Opponents said higher wages will mean fewer jobs and higher prices.